(Photo credited to Wentzler Photography Herr Zeller (Michael Kehr, standing) shows tough love toward Rolfe Gruber (Jordan Armstrong). (Photo credited to Wentzler Photography) Rolfe Grumber (Jordan Armstrong) and Johan (Sahid Pabon) show their emotions as they hold onto each other for support in The Radicalization of Rolfe. (Photo credited to Wentzler Photography) All is not as it seems in the von Trapp household. 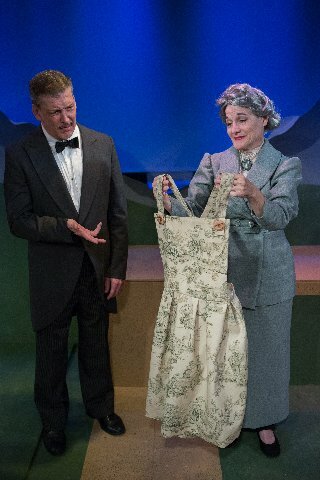 Pictured from left are Lawrence Buzzeo as Franz and Carol Caselle as Frau Schmidt. In a way, The Radicalization of Rolfe is to The Sound of Music as Rosencrantz and Guildenstern Are Dead is to Hamlet. Consider: In Rosencrantz and Radicalization, the playwrights imagine what minor characters might be talking and thinking about when we don’t see or hear them in the respective source plays. We hear and see plenty of Rolfe Gruber in Radicalization. The new play is receiving its world premiere in a sometimes strong, but not always spectacular production at Island City Stage through April 29. A show with layers and depth, such as The Sound of Music, can tempt a playwright to create an original work re-thinking or fleshing out minor developments and characters. 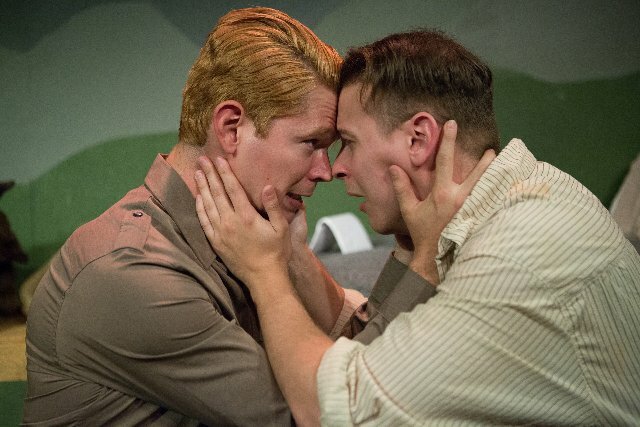 That is what Andrew Bergh has done in Radicalization, his absorbing, intriguing play. The shocker among the cast of characters is Johan, who is in love with Rolfe. Revealing Johan’s last name here would amount to spoiling a surprising revelation. Bergh has hardly ruined The Sound of Music for its legions of fans. In fact, there are a few references that will have audience members chuckling. If you’re unfamiliar with the classic musical, it wouldn’t hurt to see it before witnessing Bergh’s play. Those who never saw The Sound of Music may not get certain references. But they don’t disrupt the play’s drama or the tension people likely felt living just before the Anschluss of the 1930s, the play’s setting. The Anschluss refers to Austria’s annexation into Nazi Germany. The play’s themes, like the musical’s, are universal. Anyone should be able to appreciate the play as a stand-alone piece. Rolfe and Johan’s homosexuality makes the rising action leading up to the Anschluss chilling and suspenseful. The play’s title character, aside from feeling fearful, faces strong conflict. On the one hand, he wants to join the Nazi party. But if the powers that be learn about his relationship with Johan, the lovers could face a grave future. Rolfe must also choose between Johan and his beloved Liesl von Trapp. We met Liesl, her siblings and their father in The Sound of Music. We learned, among other things, about their mother’s death and how that has affected dad. It wouldn’t hurt, in the play, to learn more about Johan’s upbringing and how that has shaped his personality, goals and desires. Those days are nothing like today. Still, the current U.S. administration isn’t exactly embracing the LGBQT community. Some might fear that as far as we’ve come in the battle for gay rights, we’re taking steps back. Bergh’s play carries resonance to 2018 in another way. Rolfe is a young man who wants to make a mark on the world, like so many of today’s youth. As in the musical, Rolfe is an eager activist. But we also witness a wide-eyed, green, eager youth lacking in self-esteem. Boosts of confidence come courtesy of Herr Zeller, a Nazi leader overseeing the Anschluss. He’s like a father figure to the youth. Zeller also uses Rolfe as a go-between to uncover information about the von Trapps. The goal in the play remains the same as in the musical: Force Captain von Trapp into the Third Reich’s military. Playwright Bergh achieves variety in his writing. He does so by mixing highly dramatic moments with scenes that are more laid-back, “talky,” yet still juicy ones. Short, pithy scenes carry a cinematic-like quality. Little time elapses from the moment lights quickly fade on one scene to when they’re up on another. This reinforces the urgency of the proceedings. Ardean Landhuis’ set design allows for seamless, fluid transitions. His realistic, multi-leveled set, which includes a backdrop that will remind you of the musical, comprises one wide playing space. Different areas represent different locations. Director Andy Rogow’s staging can frustrate an audience, depending on where they’re seated. The auditorium is intimate, yet wide. Some scenes take place far downstage left or downstage right. While moving the action around achieves variety, the scenes taking place toward one edge of the stage obstructs the view of those seated on the opposite side. It’s also difficult to hear the performers when they are far away from you, especially since the performers tend to speak a bit too quickly. The production improves in the second act. We can hear and understand the performers better. 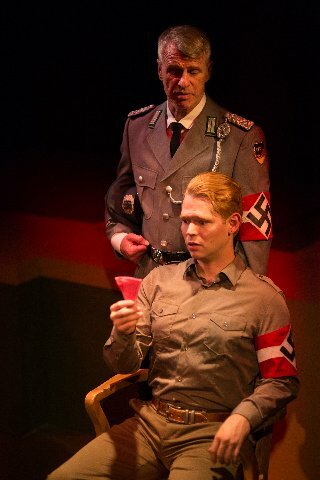 Michael Kehr, who is making a fabulous American stage debut as Herr Zeller, invests him with a commanding, often frightening aura. At unexpected moments, he shouts thunderously, like Hitler. During other scenes, Kehr’s Zeller is more subtle, but with a hint of menace. No such harshness emanates from Zeller during the opening scene. Kehr is as charming and laid back as he’s frightening as the Fuhrer. Overall, it’s a well-rounded performance, blessed with spontaneity. That quality carries over to Jordan Armstrong’s charming, smiling Rolfe. The performer makes the young man’s wide-eyed curiosity, idealism and eagerness as convincing as his visible nerves and assertiveness. There is a touching chemistry between Rolfe and Johan (a flamboyant and emotional Sahid Pabon). The pair are equally effective when they're arguing. Lawrence Buzzeo is a knot of nervous energy, impulsivity and anger as the wannabe Nazi butler Franz. He makes the character seem nothing like the, by comparison, mild-mannered man in the famous 1965 movie version of The Sound of Music. The von Trapp Housekeeper Frau Schmidt has a small part in the musical. In Radicalization, the character is prominent. Carol Caselle makes her multi-faceted. Whether her housekeeper is speaking in a hushed, gossipy tone, projecting a confident aura or conveying genuine concern, Caselle shines. There’s a naturalness about Caselle’s performance that’s impressive. This play was among the winners of the 2016 FringeNYC Overall Excellence Awards. It’s not hard to see why. It’s a taut, skillfully constructed, focused piece. Bergh includes intrigue, spilled secrets, conspiratorial planning and suspense, sprinkled with touches of humor and a healthy dose of drama and darkness befitting the time. The thunder, lightning and heavy rain in the musical sure was frighteningly symbolic in its foreboding of what was to come. Chances are, the next time you watch The Sound of Music, you’ll do so in a different light.